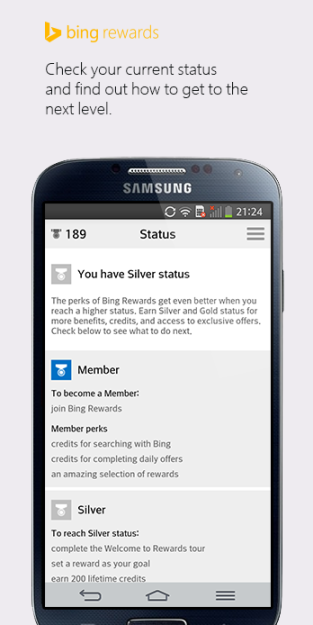 Microsoft has launched its Bing Rewards app into the Play Store, and if you're expecting an experience akin to Google Opinion Rewards, don't. This offering is even easier, assuming you can handle using Bing as a search engine. This may be painless for some folks, but Microsoft apparently wants users enough to pay them. 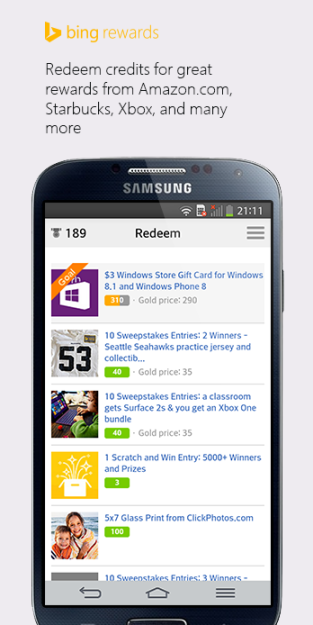 People can win points just by searching for things and eventually redeem them for gift cards and other prizes. Available reward options include Microsoft products such as free OneDrive storage, a month of Xbox Live, and Skype credit. Others include the likes of Amazon and GameStop. If you want to eat, there's Applebees and Burger King. Here is the full list. The Android app informs you on new ways to earn points and keeps up with your previous rewards. If you're willing to set Bing as your homepage for points, then you're the perfect candidate for downloading Microsoft's app from the widget below.